ThatMMAGuy is holding a contest for one lucky ready to win a great MMA product in the Throwin’ Bombs stars and stripes shirt seen on the left. One lucky reader can win this shirt by submitting their predictions for UFC 113: Machida vs Rua. All you have to do is submit your predictions for the main card. We will be needing your prediction for the winner, round and method. For example: Lyoto Machida defeats Shogun Rua via TKO of round 3. There are 5 fights on the main card and eash fight will be on a point system of up to 3 points (winner, round and method). If fights end up going the distance then those fights will then be on a 2 point system (winner and decision). I will list the main card below and good luck! There you have them and once again, good luck! The winner will be announced the day after UFC 113. 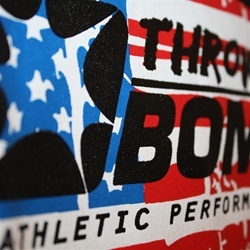 Also check out Throwin’ Bombs for great MMA gear! http://www.throwinbombs.com .